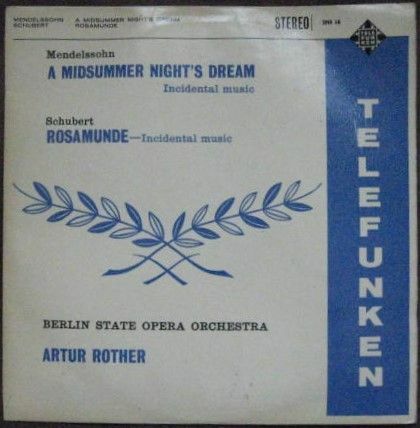 33rpm LP Record of SMA 16 Mendelssohn A MIDSUMMER NIGHT'S DREAM and Schubert Rosamunde (Incidental Music), featuring the Berlin State Opera Orchestra conducted by Artur Rother. It was issued on the Stereo Telefunken red and silver first grooved label in 1959. UK pressing. 1D/1D matrices. The record itself is graded a bit less than excellent, with one or two unfeelable surface marks visible when viewed under normal domestic lighting. Play-tested on a USB turntable. Superb sound quality, with NO jumps, ticks, or crackle and just an occasional pop. Otherwise more or less faultless playback. Minimal to no spindle wear. Labels very clean, light spider marks. The outer flipback sleeve is graded very good, with some light wear (rubbing to edges, creasing/lifting to bottom flipback edges, small open tear to same, faint ringwear, age toning). The thin spine is intact and strong. The inner sleeve has no wear to speak of.